Historic covered bridges. Birthplace of John Wayne. Storybook downtown. Good ol’ fashioned Iowa home cooking (and oh the pies!). 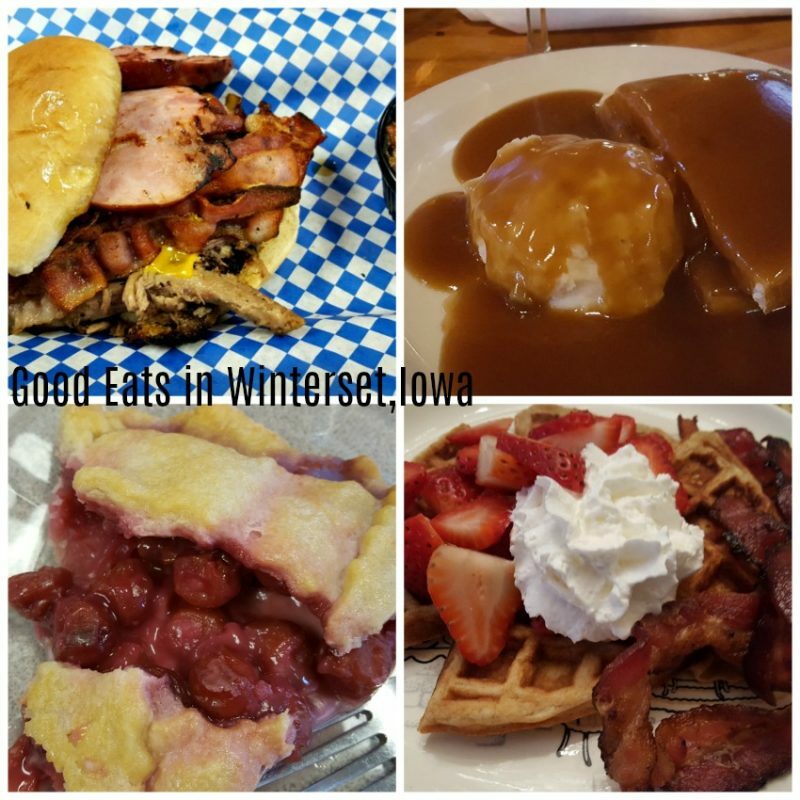 This and more awaits you in this Iowa small town, and these are only a few of the reasons why you should visit Winterset, Iowa. 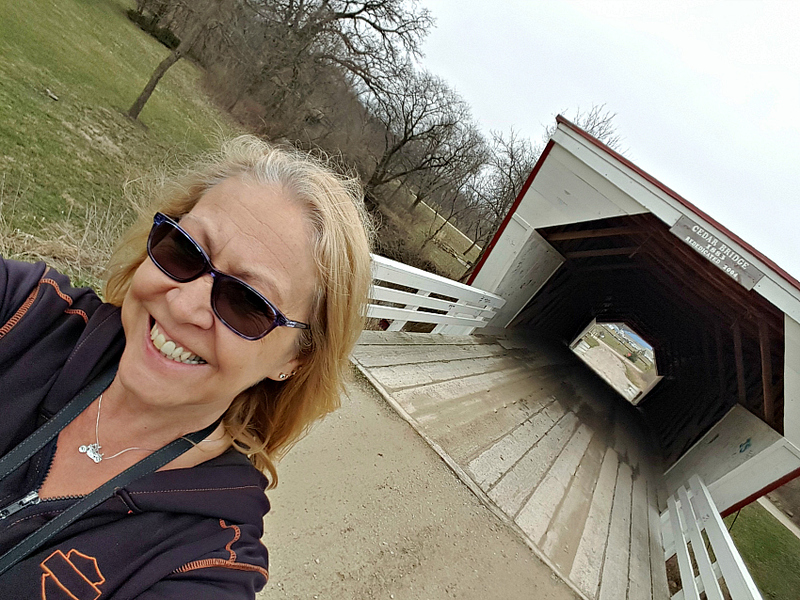 Known as the covered bridge capital of the world, Winterset, Iowa area features six covered bridges inspired the novel and movie, Bridges of Madison County. Just 30 minutes southwest of Des Moines, I discovered a real Americana small town, Winterset, with BIG things to do. These rolling hills of Iowa were the birthplace of Hollywood legend John Wayne, and the town honors him with a museum and trail, drawing thousands of international travelers. This region also inspired the novel and movie, Bridges of Madison County, a love story about the area’s six covered cedar bridges. This post may contain affiliate links. 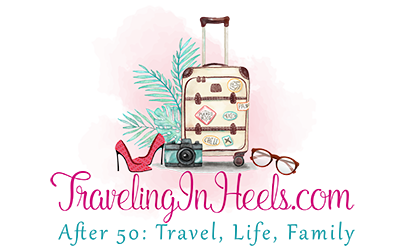 If you click through and buy, TravelingInHeels will get a small commission. Thank you for your support! Thanks to Travel Iowa for hosting my visit; opinions expressed are my own. 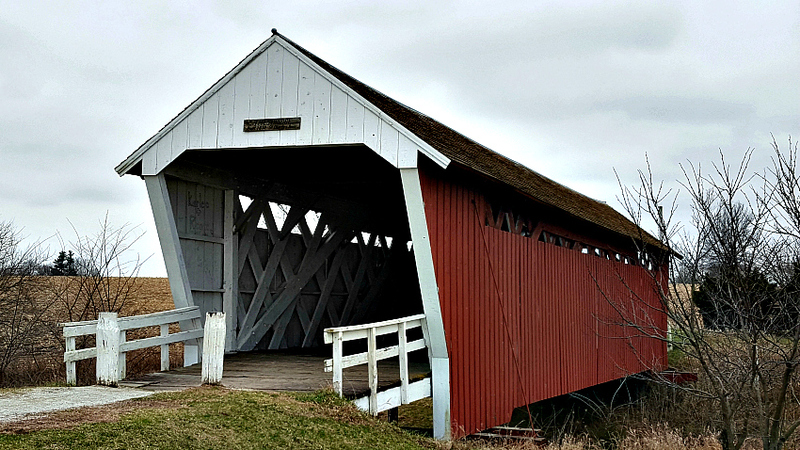 Its covered bridges are just one of many reasons to explore Winterset, Iowa. 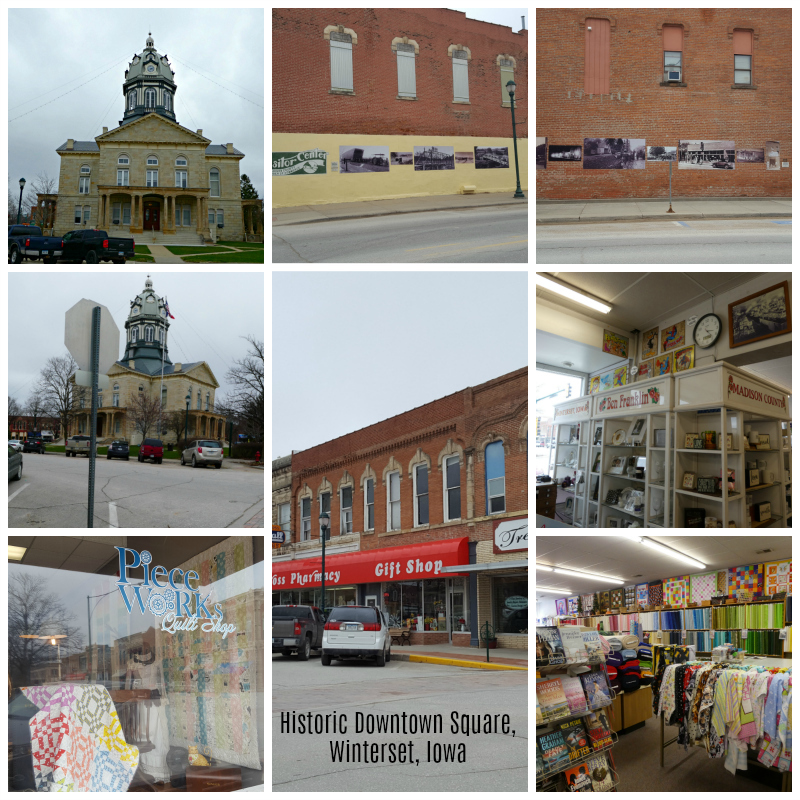 This may come as a surprise…but Winterset, Iowa had been on my travel bucket list forEVER! Seriously. 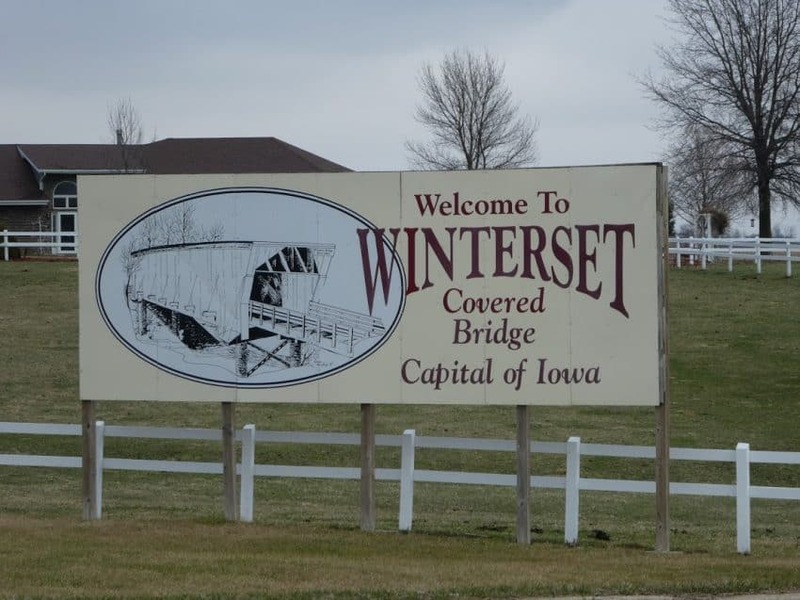 Even though I grew up in Iowa and perhaps drove past Winterset dozens of times, I had never visited there. I blame that epic (yet sad) love story, The Bridges of Madison County book and movie (featuring Clint Eastwood and Meryl Streep), for inspiring me to visit. Unfortunately that Winterset visit wasn’t in the cards until decades after I moved away from Iowa. Since I took the time to travel back and visit Winterset, I can’t believe it took me this long! So that’s my advice to you — don’t wait! Go visit Winterset, Iowa, and here’s why. The storybook downtown town square in Winterset, Iowa. Explore this historic downtown town square with quaint shops, galleries, restaurants, Iowa Quilt Museum, and local businesses. (No mega Walmart here!) Browse the aisles of the vintage five and dime Ben FranklinVariety Store, with its unique souvenirs and toys from Little Golden Books to toy fire engine trucks. Definitely take time to stop at the unique Iowa Quilt Museum, located on the south side of the town square in an old JC Penney building. 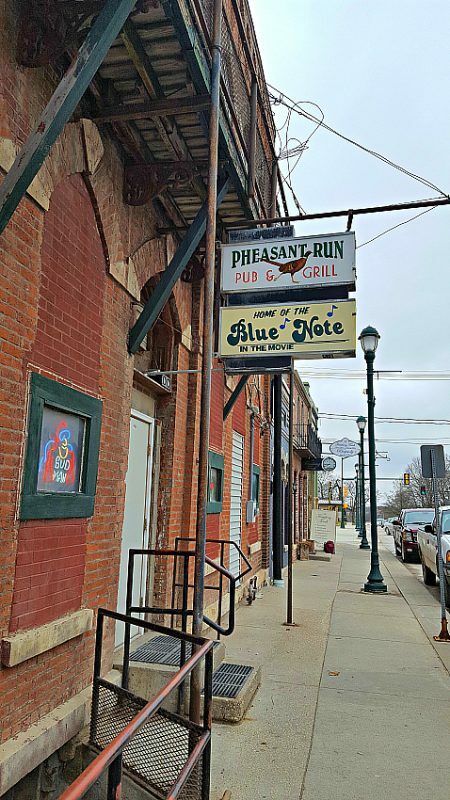 Finish your day in Winterset by stopping at movie sites like “The Blue Note Lounge” (now the Pheasant Run Pub & Grill) where Francesca and Robert go dancing away from town, and the intersection by Frostee’s where the “truck scene” was filmed. 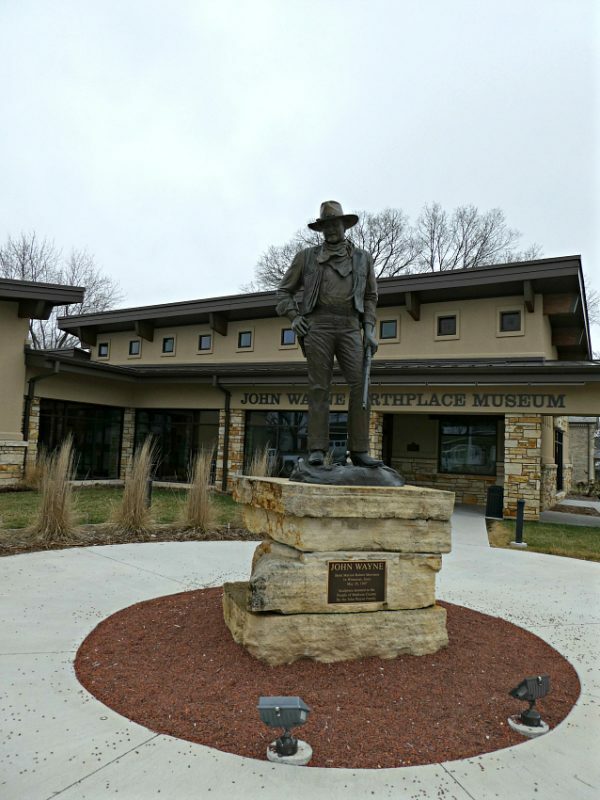 Take your buckaroos to visit the John Wayne Birthplace & Museum, located steps from the historic town square of Winterset, Iowa. 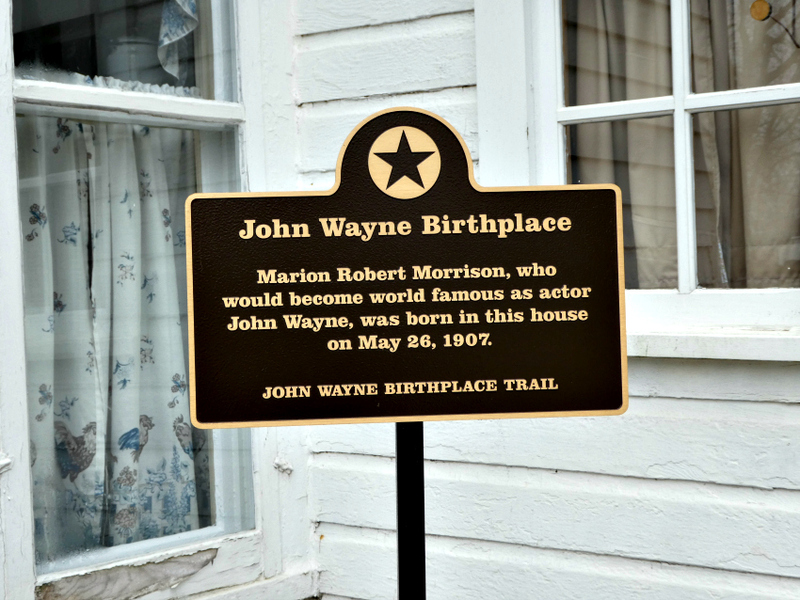 When your little buckaroo — or your older buckaroo — is fascinated with all things cowboys especially Old Duke, visit Winterset, Iowa, the birthplace of Hollywood legend John Wayne, born as Marion Robert Morrison. The town honors him with a world-renowned museum and trail. Take a selfie with the super-sized John Wayne sculpture in front of his museum. Pick up your John Wayne trail map and brochure at the Madison County Chamber Welcome Center or the John Wayne Birthplace Museum. The trail includes six stops in Winterset and nearby Earlham. Start your John Wayne adventure at his birthplace home a few blocks from his museum. The trail continues to the Winterset Train Depot (restored in 1991), where the Morrisons began their travels that would eventually take them to California. 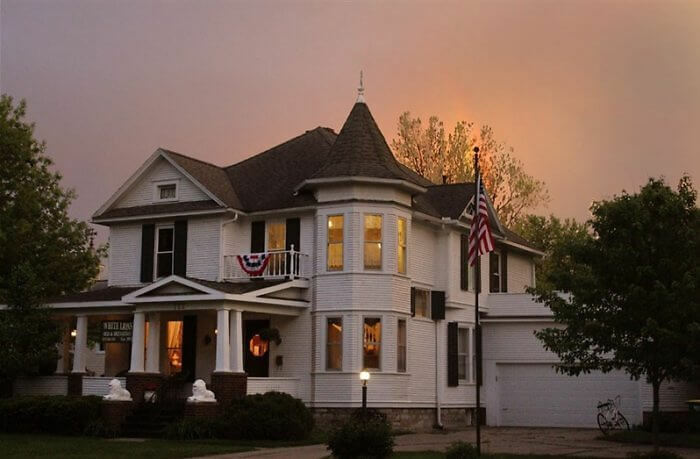 Fans of Actor John Wayne will want to visit his childhood home of Winterset, Iowa. 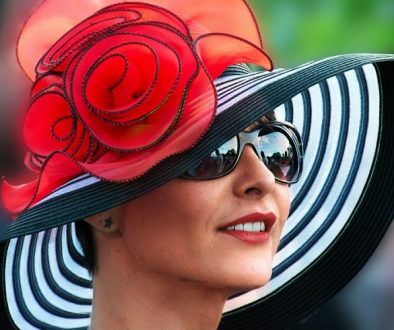 From there, go to the Village Bootery on the south side of the square, where the M.E. Smith Drugstore had its home. Wayne’s father, Clyde, worked there as a pharmacist, before moving to the town of Earlham in 1910 and purchasing what was then the W.A. Pickford & R. W. Orris Rexall Drug and Jewelry Store for $7,110. Customers reported the young Marion riding his broomstick horse around the store. If you’re really a fan of this famous actor, consider attending John Wayne’s annual Birthday Celebration. The 76-acre City Park contains one of Winterset’s famed covered bridges and a stone bridge used in the movie. 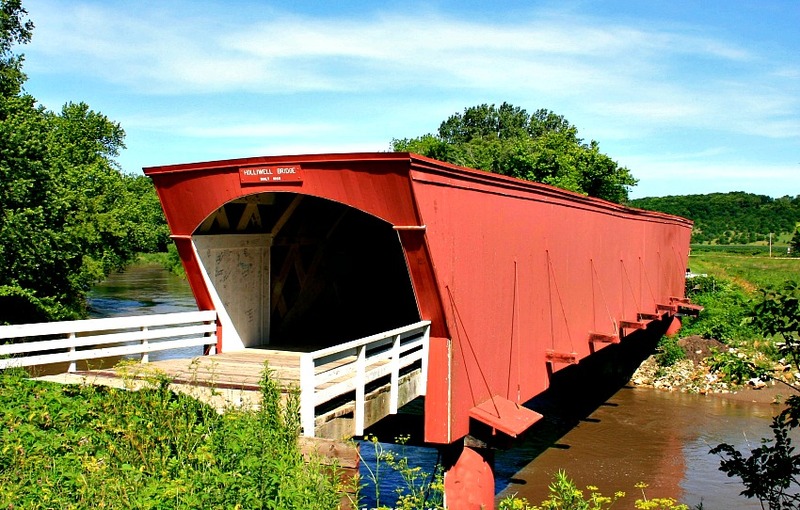 Walk across one of Iowa’s iconic covered bridges, the Cutler-Donahoe Covered Bridge, and get a glimpse into its history by reading the names and years inked on its walls. Become part of that history by writing your name on its walls too. Get lost (or find your way) exploring the English Hedge Maze – be sure to look for the hidden sundial. Hike or drive the two miles roundtrip to climb the stone Clark Tower and be rewarded with a panoramic view of the rolling hills. 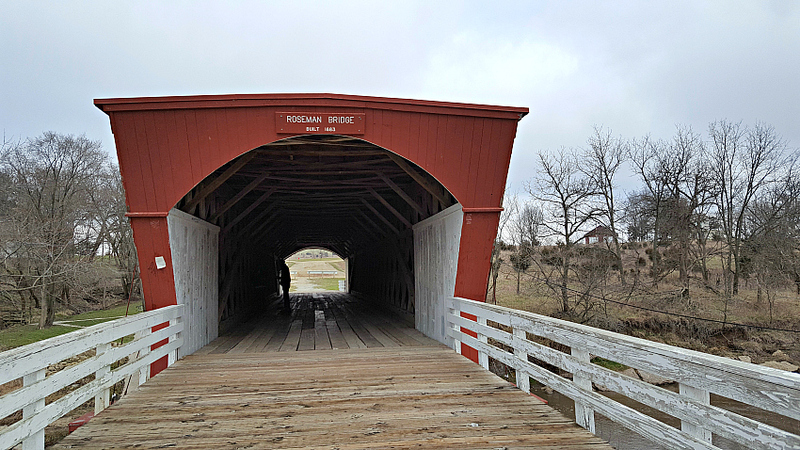 One of 6 Madison County Bridges is Roseman Covered Bridge, built in 1883 and renovated in 1992. A total of 19 covered bridges were built in Madison County in the 19th century, with only six remaining. Pictured above, the Roseman Bridge was featured predominantly in the movie including where Francesa pinned a note inviting Robert to dinner and where she asked for her ashes to be scattered. Built in 1870, Cutler-Donahoe Bridge was moved to Winterset’s City Park in 1970. 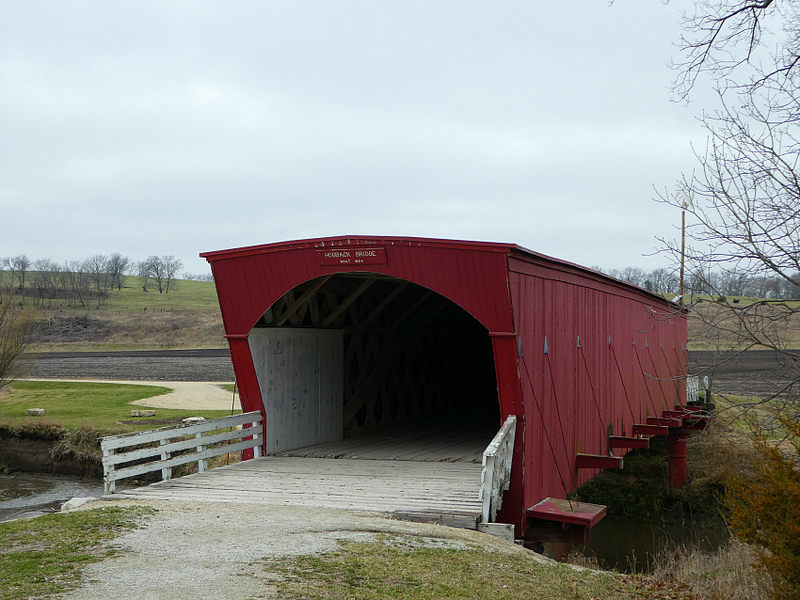 Hogback Bridge is one of the 19 original Bridges of Madison County Iowa. Built in 1884, Hogback is one of the 19 original Bridges of Madison County and still sits on its original location. This covered bridge gets its name from the limestone ridge which forms the west end of the valley. The Holliwell Bridge is the longest of the covered bridges, measuring 122 feet in length. Located in St. Charles, Iowa, the Imes Bridge is the oldest of the remaining bridges, built in 1870. 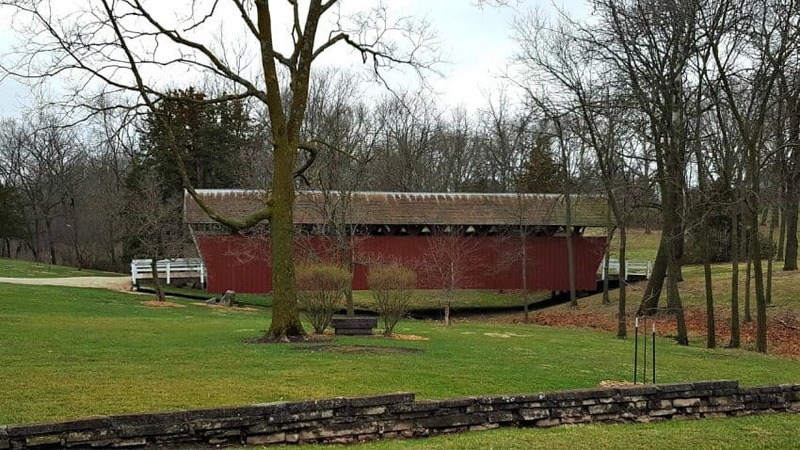 The oldest of the remaining covered bridges, Imes Bridge was built in 1870 and is now located in St. Charles, about 15 minutes from Winterset. Just two weeks after my visit at the end of March 2017, the Cedar Covered Bridge was nearly destroyed by arson. Built in 1883, Cedar Bridge has unfortunately once again been almost completely destroyed due to arson, most recently in April 2017. This bridge is where Francesca goes to meet Robert to help him take photographs. Add this to your calendar! Attend the annual Madison County Covered Bridge Festival, each year on the second full weekend in October. Located 4 miles southwest of Winterset, get active and visit the Pammel State Park, originally one of the first State Parks dedicated in 1928. Discover plenty of outdoor fun including historic sights, extensive trails, a nature center, and the only highway tunnel in Iowa. Middle River runs through the park, with a ford providing perfect splashing for kids. 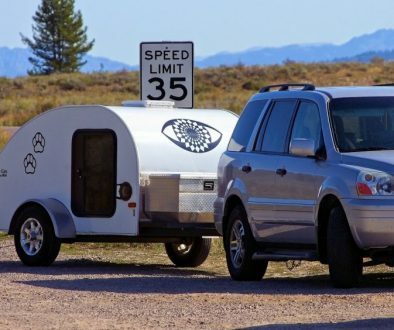 Modern camping sites are also available, as well as limited tent sites. Or stay where the cool kids stay—in a yurt! Pammel State Park Yurt Cabins rent for $70/night. Settle in as Winterset, Iowa serves up some yummy home cooking. The grand finale? Share an old-fashioned banana split at Frostee’s, the local ice cream shop. Check into the White Lions Bed & Breakfast with its Victorian charm in an intimate setting and you’ll get all that and more. Cobblestone Inn and Suites (Rate Range: $89 – $119). Pammel State Park Yurt Cabins ($70/night)! White Lions Bed and Breakfast or its Guest House at Cedar Lake (B&B start at $100. The Guest House room rate $150, minimum 2-night stay). Precious little towns absolutely have my heart. There is something about them that is so relaxing and good for the soul! Honestly, you could have convinced by just sharing the food photos. That looks delicious, but I have to say I am such a sucker for beautiful covered bridges. I love them! I’ve always wondered where that particular Madison County was! Everytime I have passed a county sign announcing I was entering Madison County, I always wondered if that county was the one! 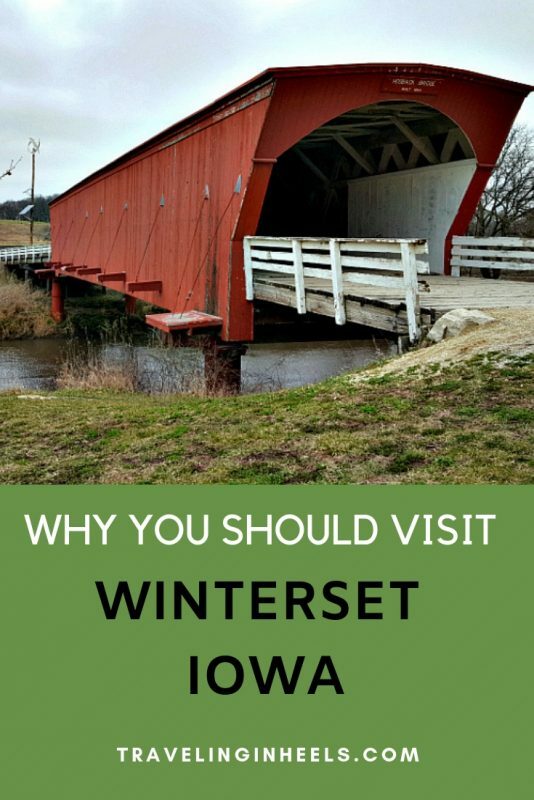 Now that I know the famed six covered bridges are in Iowa, I have to put Winterset on my bucket list. Thank you! I love visiting cute, small towns. I’ve never been to Iowa but it looks like a great place for families to visit! Winterset is really a small town, but it packs so much fun into it. Yes, perhaps a bit of a western feel, and the White Lion B&B was from the Victorian Era. And the covered bridges — so amazing! Thanks for your comments, Lillie & Jody. As a covered bridge enthusiast, I would love to visit this region — or any part of Iowa, for that matter. 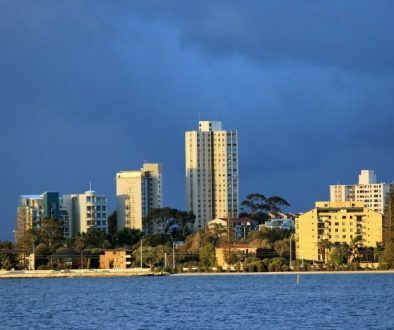 I can’t believe I haven’t been, yet! Hogback Bridge looks particularly historic and charming. That White Lion B&B looks so charming. Winterset seems to have a western feel to it, which surprised me. I’m happy to finally know where the Bridges of Madison County was set!